Computer code is not a cryptic activity reserved for geniuses and oracles. In fact, in a few minutes you will be writing some computer code yourself! Most computer code performs a range of tasks from the mundane to the extraordinary. Code runs traffic lights and pedestrian signals, elevators, cell phone towers, and space ships headed for outer space. You also interact with code on a more personal level, on your phones and computers, and usually to check email or the weather. Computer code is a set of statements, like sentences in English, and each statement directs the computer to perform a single step or instruction. Each of these steps is very precise, and followed to the letter. The following figure shows lines of code from the popular game, Pong. Do not worry about trying to understand what every single line does, or feel intimated. You will soon be reading and writing your own code. One rough way to measure a program’s complexity is to count its statements or lines of code. Basic applications like the Pong game have 5,000 lines of code, while more complex applications like Facebook currently have over 10 million lines of code. Whether few or many lines of code, the computer follows each instruction exactly and effortlessly, never tiring like the waiter might when asked for the 100th time for the location of the restroom. Be careful of only using lines of code as a measure for a program’s complexity. Just like when writing in English, 100 well written lines of code can perform the same functionality as 1,000 poorly written lines of code. If you have never written code before, now is your chance to try! 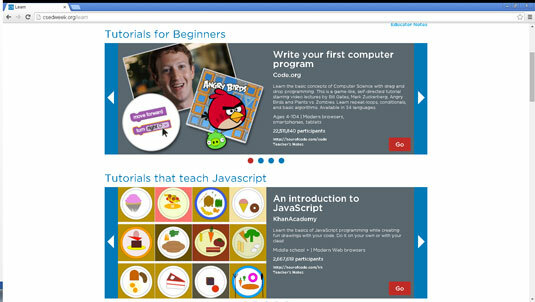 Go to Computer Science Education Week and under the heading “Tutorials for Beginners” click the “Write Your First Computer Program” link with the Angry Birds icon, as shown. This tutorial is meant for those with no previous computer programming experience, and introduces the basic building blocks used by all computer programs. The most important take-away from the tutorial is to understand that computer programs use code to literally and exactly tell the computer to execute a set of instructions. Computer Science Education Week is an annual program dedicated to elevating the profile of computer science during one week in December. In the past, President Obama, Bill Gates, basketball player Chris Bosh, and singer Shakira, among others, have supported and encouraged people from the US and around the world to participate.